Offered in two shades of red (Jalapena Red and Canyon Red) as well as white and silver, the 1985 Twister II Special Mustang sported black side stripes and Twister II lettering as well as a black striped hood. The Twister was only offered in the Kansas area and could be ordered with on any GT (convertible or hatchback) with any GT options. The Twister was first offered in 1970 but only came on the Mach 1 in Grabber orange, and in 2008 as an aftermarket Grabber Orange GT upgrade; but both in the Kansas area only. 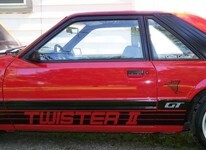 76 hatchbacks and 14 convertibles were sold as Twister II Specials. This is a Jalapena Red 1985 Mustang GT Twister II convertible. It was sold at the 2005 Barrett Jackson Auction held in Scottsdale, Arizona for $10,450. It has the 302ci V8 engine, 5-speed manual transmission, air conditioning, power windows, and power door locks. Only 90 Twister IIs were built in 1985. 14 of them were convertibles! This one does not have the GT black striped hood or 5.0L emblems on the front fenders. The car is unrestored and original.